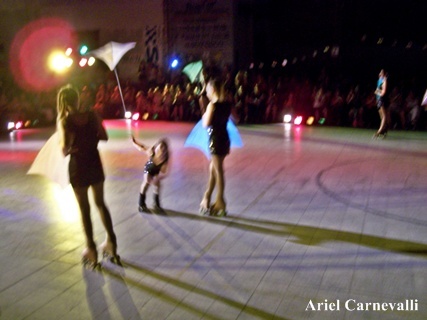 Since I started to fly indoor kites, an idea was present in my mind: “Play with kites and play with skates” at the same time. 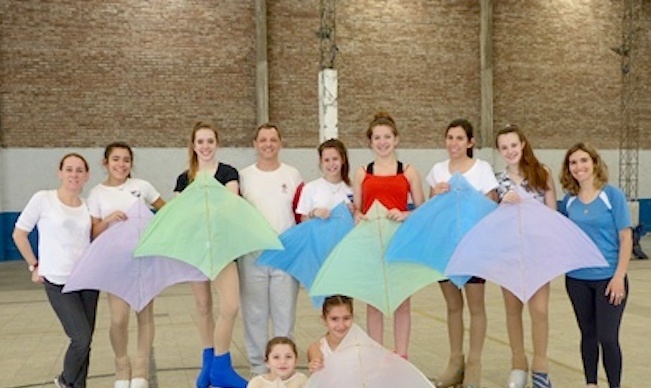 In other words, “linking figure skating and indoor kite flying” for the first time in Argentina. Every sport has a tradition and figure skating is no stranger to it. Skating emerges in the seventeenth century to satisfy the need to travel. Its development and evolution has become a sport. Nowadays those who practice and teach, were forming a pattern or skating culture, focused on developing and refining techniques that are peculiar motion. Edna, my daughter, is 7 and nowadays is playing figure skating, she also flying one line indoor kites since she was 3. So I asked her: Would you like to fly kites while skating? With her grin and astonish face she said: Yes daddy! 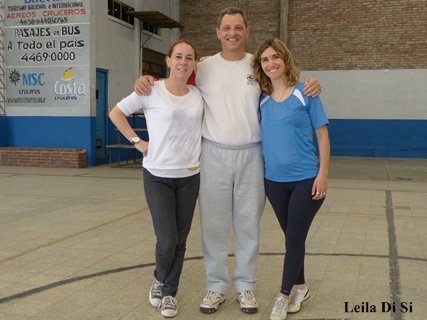 This story starts thanks to the support from Edna’s teachers: Alejandra Bueno and Valeria Giovagnola from “Club Social de Villa Sarmiento”. With their help, the project became a reality. 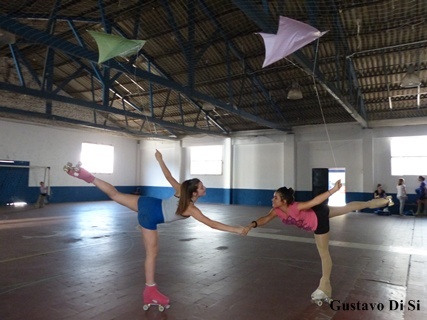 Alejandra and Valeria conveyed the idea to the students, who accepted, in order to include the demo at the Artistic Skating Show. 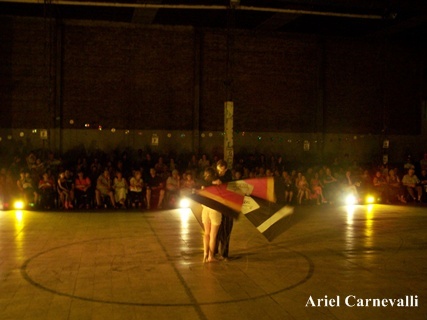 At the program´s organization, they requested that we participate with two Indoor demonstrations. 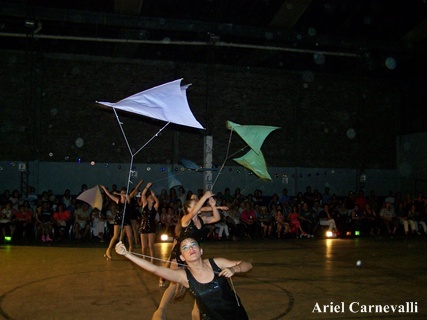 We agreed that the team “El Alma del Piloto Quadrigis” would fly kites in pairs with Revolution Indoor. My daughter Leila and I performed these demos. Also they want to see my team “El Alma del Piloto Quadrigis” flying Indoor. 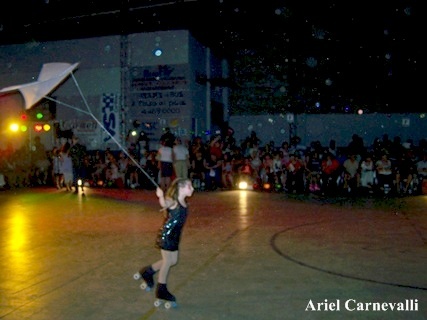 So, my daughter Leila and I performed with Revolution Indoor kites. Then, the next skating training would be something different. From my point of view there are some common elements in both sports. The artistic skating and indoor flying are sliding sports disciplines where athletes combine; technical elements, artistic aspects, requiring good preparation and concentration. Furthermore, it must have felt good ear for music adapting their movements to it. In this movements integration we must maintain the control of sliding on wheel and Kite. To the challenge of this integration, the skating was practically solved; would only have to adjust the speed, for apparent wind. But, catching apparent wind (speed sliding) was essential mastering the art of flight. Here we had to start from scratch since none of the skaters had flown kites, much less indoor. The kite chose was Borelli Glider by virtue of their easy construction, cheap materials, excellent design, and because sometimes a simple kite can also achieve ” astonishment “. 2013 El Alma del Piloto Quadrigis from elalmadelpiloto on Vimeo. 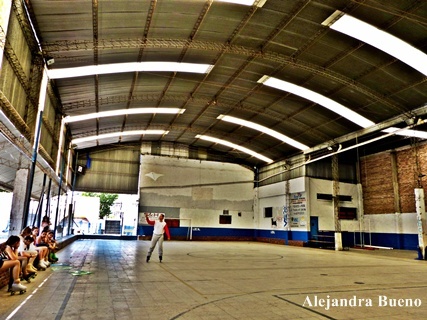 At that time Nelson said, “Gustavo I give you the materials to build the kites “…Thank you my friend! 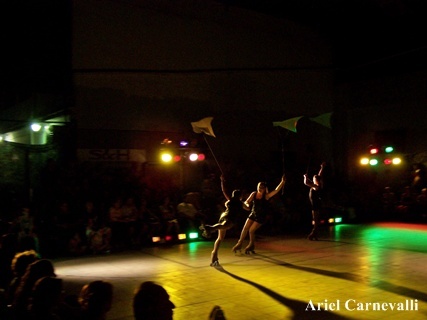 So I went to work not only making Borrelli Glider Kites, but also in the show thinking about the theme, choreography, techniques, artistic expression, music, and dance. It was a great challenge because we are going to do an opening of Skate Art Show. Wow! 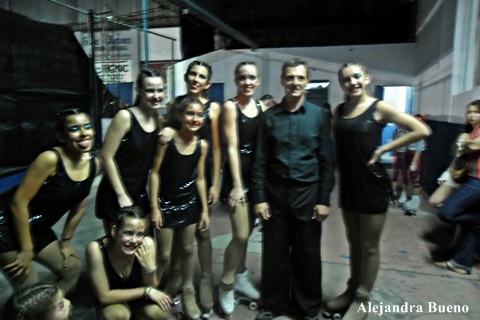 To advance on the skills we continue without skates and obviously the difficulties began. Run, stop, turn, and move the body coordinating, getting the arm like an extension of the kite was not that easy. The teenager’s impatience seems to feel: “Kites does not work “,” Kites drop it “… uf…! Again and again I conveyed the message:” Ladies the thread is the umbilical cord that connects the pilots with his kite, transmits life, feeling, so “when you see the kite flying you can see the pilot´s soul “. Step by step the progress was giving their results with successes and frustrations. Guys, no walking path, just do it. Sharing my vision with teens was challenge; I generate new possibilities for those. Teaching and learning are two sides of the same coin. 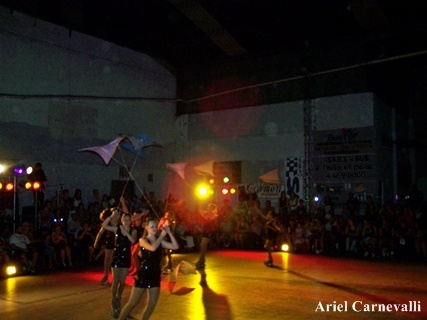 In fact, when I saw them skating I made ​​me want to get on the skates and fly with them. Paradoxically the most difficult to achieve by the group of skaters was learning to skating freestyle clinging to a learned pattern consistently for years. So, I think that learning Indoor kite flying as freestyle helped to discover another facet of the talent that had hidden. The first routine expresses the dichotomy that teenagers feel about that they need discipline and freedom. Edna Di Si start to fly its Borelli Glider watching order, after that the pilots start the demo routine. At first, the pilots performing geometric patterned, these being coordinated almost mathematically and predictable. The message is in conjunction with the music composed by Roger Waters “Another brick in the wall” by Pink Floyd; that he relives the harsh rules imposed in schools for formal education, being the most interest from teachers in maintains discipline instead of transmitting knowledge. Averaging the track, begin music paraphrasing the mechanical flying breaks that rigorous; became free, where improvisation is the main reason of flying. Observe that the faces transforms in a more cheerful, relaxed and natural grin. The feeling emanates through body movements accompanying skate and kite flying. Edna Di Si, go into the arena trying to return the order established by the system, but it has been a change itself..
2013 Volar en Libertad from elalmadelpiloto on Vimeo. “The Phantom of the Opera” story was written by Gaston Leroux and published in 1909. The story combines romance, horror and mystery where the angel of music and song are those that convey the fascination. Our choreography was inspired on the musical opened on 1986. The music selected is a combine of sound track movie 2004 and the song by Secret Garden. So the idea is that the angel is also present but different from the original story; the aura of mystery is from music and flight surrounding the youth. When the young lady see the Phantom´s flight; she becomes his inspiration and together conveys the fascination to the audience. 2013 El Fantasma de la Opera Rutina from elalmadelpiloto on Vimeo. The third routine, “Staying Alive” by Bee Gees; is a completely improvised flight, which conveys the idea of being committed to life, when you share ideas and projects with youth. Eventually I´d like to say that flying with my daugther Leila was wonderful; “The Phantom of the Opera” performance tested its technical and emotional skills in a demanding routine. The same was to Edna, because she opened the Show. We live together a wonderful moment when fear, uncertainty, anxiety and excitement felt in the stomach, touching the depths of being. Everything is exceeded when that magical atmosphere envelops you and the scene starts. 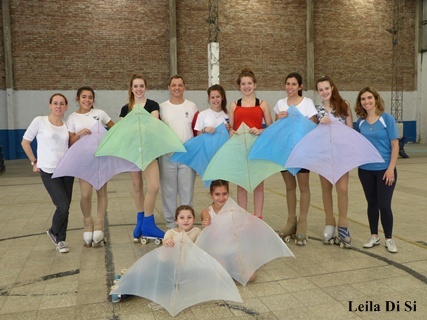 It has been a great experience where we learned and shared something new: combining indoor kite flying and figure skating in Argentina. I felt great, to see the identification, commitment and overcoming instinct of my team. I feel that we have taken the first step and that is good stuff. 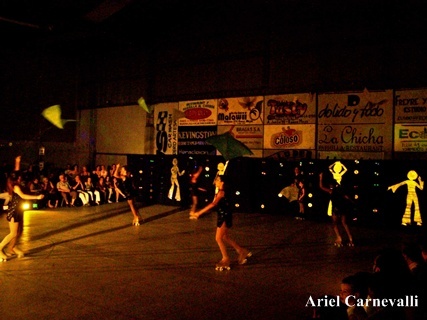 This entry was posted in Indoor Kiting and tagged featured, figure skating, indoor kite flying.